Building young minds, one book at a time. Have you ever wondered why Denmark is considered one of the happiest countries in the world? Especially during the winter months, you wouldn’t expect such a cold, dreary place to be so cheerful. And yet, the Danish people have mastered the “art of coziness”. They call it hygge. Hygge is a word technically unable to be directly translated, only felt. Imagine sitting in front of a roaring fireplace, wrapped up in your warmest blanket, sipping a cup of tea (or coffee), and reading your favorite book. This is hygge. Even when the weather is nice, Danes are still one with the cozy. My oldest daughter has also become recently obsessed with The Little Book of Hygge: Danish Secrets to Happy Living by Meik Wiking. For those that are not familiar with this, we can try to establish some of the basics and hack together some definition like concepts. If you really want to get in to the full details on all that is hygge – candles, tea, cozy socks and blankets, etc… you can get the book, or search for hygge websites. 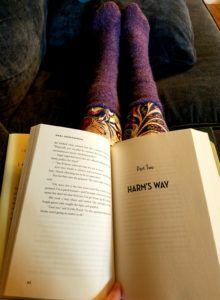 But for this article I will discuss some “hygge homeschool” things you probably already did without knowing that hygge existed, or some simple ways to incorporate the hyg into your routine. Who doesn’t already have kids homeschooling in pajamas? Or moms wearing sweats or yoga pants? Hygge is all about cuddling up with a good book in comfy, warm clothes or under a thick blanket… with or without a fireplace, with or without candles… But this already sounds like a perfect homeschooling session, and you didn’t even know about this hygge thing. A hyggekrog can be roughly translated as a comfortable nook. It’s a special place within your home where you feel the coziest and can experience hygge to the fullest. Most people in Denmark have a hyggekrog somewhere in their home, often beside a window where they can get the best light. They’re really easy to set up – just arrange some pillows and blankets, maybe even build a fort, and get cozy. This may be the answer to stressful homeschooling – get away from sitting at the kitchen table for lessons and curl up under some blankets with a warm beverage to complete your school day. Who says learning can’t happen inside a blanket fort? I have to admit, one of my newest favorite things is a “Catalonia Wearable Fleece Blanket with Sleeves & Feet pockets“, which I think is better than those as-seen-on-TV Snuggie Blankets with just arms. 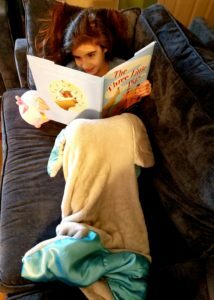 My youngest even just got one of those Snuggy Tails for Christmas, that looks like a shark blanket that is eating you. Definitely hygge! Another concept of hygge is spending quality time together with loved ones, without being attached to your cell phone or other electronic devices. Of course the second part of that seems difficult at times, but trying to put the cell phones away for extended periods of time and “being in the now” is always a welcome and enriching way to devote hygge-inspired energy into your homeschool routine. This can be time spent reading together, taking a morning nature walk, enjoying a picnic at the park, or even playing board games together after dinner. Besides, isn’t this one of the reasons you started to hyggeschool, I mean homeschool in the first place? While maybe not my personal idea of hygge, according to the book, hygge is something that a lot of people like to experience by going outside and playing in the snow, going skiing, sledding, hiking, etc… One of the first things that comes to mind is the nature study that you probably already do. If not, taking a formal “study break” and just getting outside to experiencing nature, both for fun and academic benefit is always a great idea. 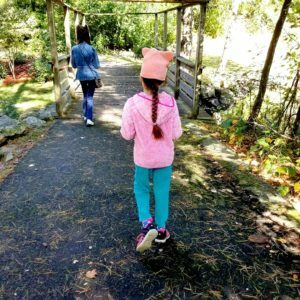 Grab a notebook and some pencils and hit the backyard, park or nature trail. Sit under a tree, relax and draw some of the animals, trees and flowers that you see. I suppose it would be less hygge to pull out your smart phone and look things up, so maybe pack a field guide book for quick reference. Or use your phone… sparingly… we aren’t hygge purists! Cooking is one of the most obviously hygge – comfort food! But also other creative activities such as scrapbooking, journaling, and craft-making are all very hygge and relaxing, as well as being fun memory-making activities that are tech-free. It doesn’t have to be crafting – drawing and even coloring can be great ways to unwind and relax and experience hygge after a busy day. Enjoy a good book: Kind of goes with out saying… isn’t hygge great? 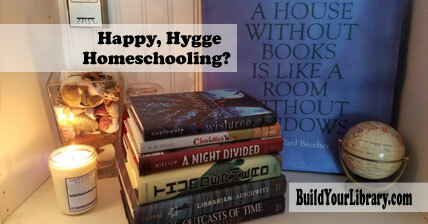 Hygge seems to be a concept that meshes so well with homeschooling. Just educating our children at home can be a comfort in itself. We can relax and spend time together without worrying about rushing out the door in the morning to catch a bus, meet with teachers or any of the other number of stressful things that comes with being tied to someone else’s schedule. Hygge homeschooling means you are spending quality together, being cozy at home, and learning together. By the definition, Build Your Library is all about building a sanctuary and community full of living books, overflowing with literature that makes a family feel open hearted and alive. We strive to build young minds, one book at a time by creating a well-being, connection and warmth of knowledge. The feeling of belonging to the moment and to each other while celebrating the everyday is also a major tenant of our Charlotte Mason inspired homeschool philosophy. We might as well have been a Danish homeschool company, although we are from the United States. And you are probably more hygge than you thought you were too. One last time, “Na na na na, na na na… Na na na na, na na… Gettin’ hygge with it…”, in case our first ear-worm didn’t take hold! 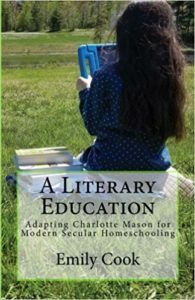 Emily Cook is the author and creator of the secular homeschool curriculum Build Your Library, a literature-based K-12 program infused with the teachings of Charlotte Mason. She writes full year lesson plans as well as shorter topical unit studies. Emily has been homeschooling her four children in Southern NH for 15 years. She is passionate about reading aloud to children of all ages and loves to share her love of literature with others. She and her family also makes incredibly dorky videos about homeschooling, books and more on Youtube at ARRRGH! Schooling. You can follow her on Facebook, Twitter and Pinterest. You can also check out her author page on Amazon. Have you seen my new book? Ahhh, love this post! And thank you for providing us a perfect introduction to Denmark for our global studies! With fall finally upon us, we can embrace all those hygge moments! Have you been looking for a literature based homeschool curriculum that is secular? How about a way to incorporate narration, copywork, dictation and memory work into your child’s education? Or art study that ties into history?